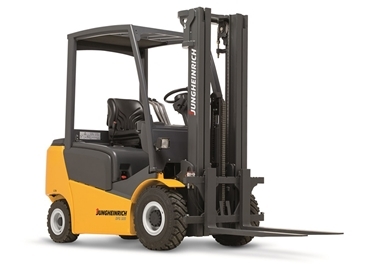 NTP Forklifts Australia presents a completely redesigned generation of IC (Internal Combustion) engine powered forklift trucks from Jungheinrich. Engineered and manufactured in Germany, and introduced at CeMAT in May 2014 in Hanover, the new general purpose, reliable and rugged trucks deliver above-average throughput rates with simultaneous low fuel consumption. The new generation stackers handle payloads of up to 3,500kg, with maximum stacking height of 7.50 metres. Jungheinrich is simultaneously launching two new series of internal combustion engine powered counterbalance forklift trucks - hydrodynamic torque converter drive trucks in the DFG/TFG 316-320 and DFG/TFG 425-435 model ranges. The new forklift trucks manufactured at the Moosburg production plant in the German state of Bavaria are all powered by Kubota engines. Marek Scheithauer, Head of Product Management for IC Engine Powered Counterbalance Trucks at Jungheinrich explains that the industrial engines, tried and tested around the world in heavy-duty construction machinery, already deliver high torque at low revs. The robust stackers boast high-grade, extremely durable, long-lifetime components and are ideally suited for extreme, tough operations in different climate zones. According to Scheithauer, the need for trucks that can operate in harsh operating environments inspired Jungheinrich to apply the latest in-house engineering developments to the new torque converter’s core components. These include innovations to the mast, chassis and steering column. The counterweight on the new stacker is an integral part of the load-bearing chassis, while the steering column was integrated in the counterweight. The low centre of gravity, which is also optimally positioned between the axles lends the forklift truck outstanding stability and makes additional, electronic stabilisers redundant. The proprietary Jungheinrich transmission shaft in the new torque converter features an integrated non-wear wet multi-disc brake. Compared to standard drum brakes, wet multi disc brakes mean almost no service costs. Thanks to their encapsulated design, brake performance is not impacted by the harsh external conditions. The high-performance cooling system functions fully even in very high ambient temperatures. The radiator is a single unit made of 100 per cent aluminium ensuring that the new truck with torque converter is well equipped to handle dust and other punishing ambient influences. Key advantages of the new range of Jungheinrich forklift trucks also include fast, easy and economical servicing requiring minimum technical expertise thanks to the high-grade and rugged components; high stacker availability with minimal interruption of internal production and logistics workflows; excellent access to the engine compartment with the L-shaped engine bonnet tilt-able to almost 90-degrees and quick-release side panels; improved cab design for operator comfort; electric parking brake as standard; and a new lifting mast design ensuring improved view of the payload, forks and general working area. For operator comfort, the slim steering column of the seat offers greater leg room compared with industrial trucks; adjustable seat for healthy and fatigue-free stacker operation; and multiple options for setting down or storing things such as beaker holder and clip pad, allowing the operator to maintain a well-ordered, uncluttered workstation.